What is an AGM (Annual General Meeting)? An annual general meeting (AGM) is a way for your company to present its financial statements (accounts) to shareholders (members). Shareholders can then ask questions about the health of your business. An AGM is therefore an important opportunity to address their concerns. All companies in Singapore are required to hold AGMs. The date of your company’s AGM is declared to ACRA when filing your company’s Annual Return with the Authority ACRA. Similarly, if your company is exempted from holding an AGM or has dispensed with the holding of AGM, you would need to submit the details when filing your company’s annual return. During an AGM, the company presents its financial statements to members, and answers any queries on the business. AGMs are conducted under the direction of the chairman of the meeting, who is usually the chairman of the board of directors. If your company’s Constitution does not specify a chairman to regulate the meeting, any member can be elected at the AGM to fulfil the role. The company secretary – or an appointed secretarial service – is required to prepare any necessary documentation for the AGM (e.g. the company Constitution). Please take note of the following when AGM is conducted. Other than ordinary business, the meeting should only deal with resolutions for which notice has been given. Subjects other than these may be considered special business. Any resolutions at the meeting, other than ordinary business, should have been mentioned in the Notice of the AGM. [Note] If you vote on a topic that was not mentioned in the notice, the resolution may not be legally valid. This is because a member with voting rights may be absent during the meeting, and have no knowledge of the matter. Note that members also have the right to propose resolutions for the meeting. However, they must bear the expense of circulating such resolutions. The quorum is the minimum number of members who must attend the AGM, for it to be considered valid. If the quorum is not specifically stated in your company’s Constitution, the minimum number is two members (or their proxies). A proxy can attend and vote on behalf of a member at the AGM. The proxy does not need to be a member of your company. The procedure for appointment of a proxy should be in your company’s Constitution; the procedure may be applicable for all meetings, or only for the current meeting. Ensure that the procedures have been followed by members using proxies. These materials should also be sent with the Notice of the AGM, at least 14 days prior to the meeting. This will allow members to prepare questions for the directors. Your company’s Constitution covers the voting rights of members, as well as the procedures for voting. Usually, all members have the right to vote, barring exceptional circumstances (e.g. a member who has not paid up for shares issued to them, when notified by the company, may be denied the right the vote). Voting is done by a show of hands or a poll; but note that proxies are usually not allowed to vote by a show of hands, unless the company’s Constitution allows this. The minutes of the AGM must be recorded in writing, and signed by the company’s chairman. The company must then file its Annual Returns with the Authority viz. ACRA. The minimum notice period is 14 days, though the Constitution may provide for a longer period of notice. The notice period can also be shortened, with the agreement of all the members entitled to attend and vote. Notices may be served personally, by post, by e-mail and other forms of electronic communications, or by any other means permitted by the Constitution. A special notice is required under certain circumstances, such as the removal of directors or auditors. Such a notice must be served to members at least 28 days before the date of the meeting. When any member is requesting the Company to hold AGM within the applicable due date after filing the Annual Return, the Company is required to notify the Registrar within 14 days from the date of AGM however it should be notified within the due date otherwise it will incur with late penalties by ACRA. Note: Notification of AGM Date is only applicable if the latest AR was filed without an AGM date. Financial Statements are to be filed in XBRL format. Companies that are not required to file financial statements must instead submit a declaration online when they file their Annual Returns via BizFile+. The declaration will appear in the transaction based on the company type selected during annual return filing in BizFile+ . Who Needs to File Financial Statements (FS)? All Singapore incorporated companies are required to file financial statements with ACRA, except for those which are exempted. Some companies will file a full set of financial statements in XBRL format, while some others will file only salient financial data in XBRL format and a full set of financial statements in PDF. The filing requirements depend on the type of company you own (see table below). If you own a sole proprietorship, partnership, or limited partnership, you are not required to file financial statements with ACRA. Public / private companies (limited or unlimited by shares), except those under (a) and (b) below Full set of financial statements in XBRL format. *Companies other than the specified types (e.g. money changers) are required to file a full set of XBRL financial statements Financial Statements Highlights in XBRL format, plus PDF copy of the financial statements. ** SFRS stands for Singapore Financial Reporting Standards and IFRS stands for International Financial Reporting Standards Financial Statements Highlights in XBRL format, plus PDF copy of the financial statements. Solvent Exempt Private Companies (EPCs) Exempted from filing financial statements. Nonetheless, you are encouraged to file the full set of financial statements or the financial statement highlights in XBRL format. (a) file a full set of financial statements in XBRL format, or(b) financial statements highlights in XBRL format, plus a PDF copy of the financial statements. A private company can have not more than 50 members. 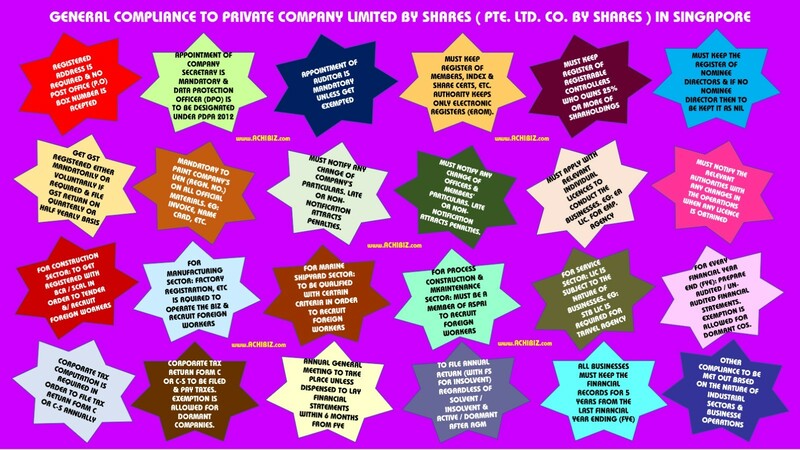 An exempt private company (EPC) can be a private company with less than 20 members, and does not have any corporations holding beneficial interest in its shares (whether directly or indirectly). An EPC can also be a private company owned by the Government that is declared in the Gazette to be an EPC. An EPC is insolvent if it is unable to meet its debts when they are due. Insolvent EPCs are required to file financial statements as mentioned above. Solvent EPCs only need to make an online declaration of their solvency, and filing financial statements are voluntary. Not all companies are required to file a full set of financial statements in XBRL format. Some companies are only required to file financial statements highlights in XBRL format, with a PDF of the financial statements tabled at the AGM. Refer to the above Table whether your company is eligible only to file financial statements highlights in XBRL format. Exemptions from specific business rules in filing your financial statements in XBRL format (e.g. removing the requirement for comparative periods in your financial statement, given valid reasons). Exemption from filing full set of XBRL financial statements, and instead filing Financial Statement Highlights (FSH) in XBRL format only, if you have valid proof that the full set of XBRL financial statements cannot be prepared. Allowing you to file PDF copy of financial statements, with valid proof that you cannot file the full set of XBRL financial statements, or FSH. Exemptions are evaluated on a case-by-case basis by ACRA. Q: What if a company fails to file its Annual Returns? A: Enforcement actions will be taken against directors and companies for annual returns filing breaches. Q: What are some of the transactions that would be disregarded in determining whether a company is dormant? The taking of shares in the company by a subscriber to the Constitution in pursuance of an undertaking of his in the Constitution. For more details, please refer to s205B of the Companies Act. Q: My company’s financial statements are exempted from audit, but we have chosen to get our financial statements audited. Should we be filing the unaudited or audited financial statements? A: Companies that are exempted from audit requirements are not required to have their financial statements audited. Instead, they will prepare unaudited financial statements for purposes of AGMs and filing with ACRA. If the company chooses to have the financial statements audited, it will submit the audited financial statements together with the auditor’s report. Q: If the company has already filed an Annual Return with ACRA, does it still need to file any documents with IRAS? The company must submit its Income Tax Return (Form C) unless it has been granted a waiver from IRAS. The company may apply for a waiver from IRAS by submitting the form ‘Application for a Waiver to Submit Income Tax Return (Form C) by a Dormant Company. The company which has filed Annual Return with ACRA must also file its Income Tax Return (Form C-S / Form C) and the necessary supporting documents (such as financial statements and tax computation) with IRAS annually.